Our Provencal rectangle table linens are available in many sizes to fit your table. 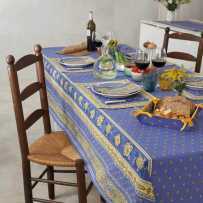 The woven tablecloths for decorative purpose are next to cotton tablecloths intented for art de la table. Most of them are anti-stain treated for easy maintenance. All are machine washable and made of majority cotton for a Jacquard tablecloth or 100% cotton for prints. Just choose a pattern and enjoy a beautiful fabric article. These articles are high in the colors of our beloved region with cotton fabrics and Jacquard woven (cotton and polyester tablecloths) of very beautiful confection. 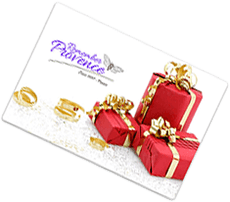 Whether you are looking for a beautiful Christmas tablecloth, a country tablecloth, or a birthday tablecloth, our catalog contains what you need. You will also have the possibility to choose an anti-stain protective coating that spaces laundry chores. 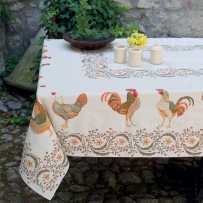 A Provencal tablecloth will always bring you simplicity of maintenance and elegance, in color or in discrete tones. We let you admire the collections of Marat d'Avignon®, with particularly elegant tablecloths that you will like to offer for a Provencal Christmas, for instance. Several dimensions are available depending on the initial width for a given fabric. 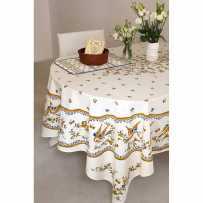 The same patterns are usually available in other tablecloth shapes for your kitchen tables, or outdoor tables. In addition, the essential accessories coordinate with the fabric you choose. 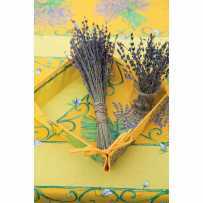 Among the printed cottons, napkins, bread baskets and placemats are presented as accessories in each product page. This way, you can access the matching articles directly without having to search among the categories. We will also offer you the opportunity to compose your table service with other coordinated items, such as the kitchen apron, for example. We want to point out that some pieces of table linen are convertible into decorative plaid. In this case, you buy two products in one for dual use. Feel free to read all the tips we write for each product to get the assortment opportunities.